The key ingredient that allows a game to stand the test of time is playability, and NBA Jam: Tournament Editon has it in abundance. Back in 1994, the Super Nintendo had long since usurped the Sega Genesis/Mega Drive as the world’s most popular home video console, introducing a whole host of stellar titles which went a step further in bringing the arcade arenas to the comfort of your very own living room. Street Fighter II: The World Warrior and Final Fight would offer excellent ports for the fighter and side-scrolling beat ’em up genres, while Super Smash TV gave fans a loyal version of a much-loved multidirectional shooter. However, such genres had been successfully adapted on lesser consoles – Kung-Fu Master (Kung-Fu) for the NES being one example – but sports games had until that point failed to truly deliver. However, that was no longer the case. Technically, the original NBA Jam had set the standard, but it was the game’s Tournament Edition, released the following year, that gamers remember most fondly. There wasn’t a whole lot of difference, the latter just smoothed the corners, adding that little bit of baller stardust. More player attributes and substitutions were introduced, adding a new level of depth and realism, while the titular ‘Tournament’ Mode gave both the game and its players that added competitive edge. The game is also one of the first sports games to feature NBA-licensed teams and players, featuring relatively realistic digitized likenesses – at least for the time. Always bet on the black guy. 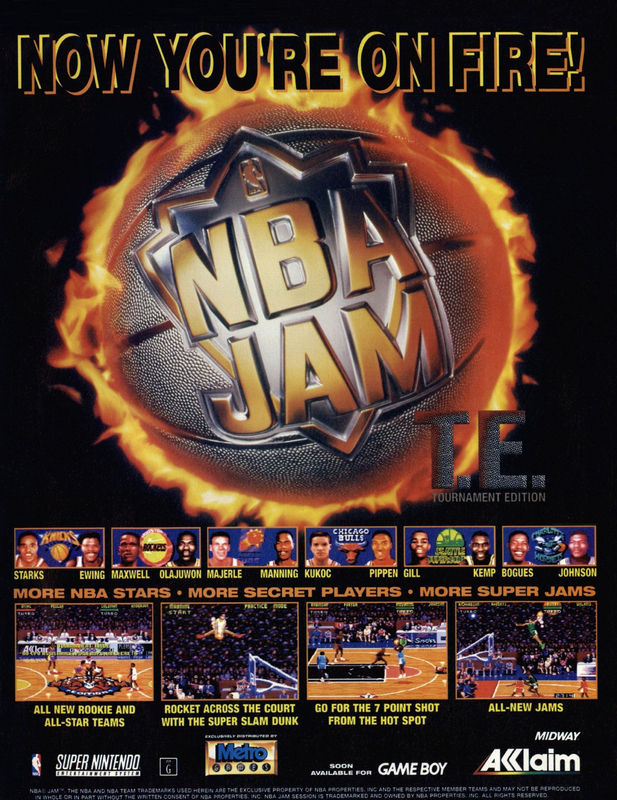 NBA Jam‘s 2-on-2 gameplay is based on 1989‘s low-key effort, Arch Rivals, but it was the addition of licensing that allowed the game’s successor to reach a larger audience, eventually attaining worldwide appeal by the time Tournament Edition hit the shelves. The game also featured live-action commentary – as primitive as it may now seen – using widely acknowledged basketball terms which only added to the game’s authenticity and excitement. Phrases such as ‘He’s on fire!’ and ‘Ugly shot!’ became universally recognisable thanks to the NBA Jam franchise. Of course, that is where the realism ends, and to the game’s credit. Realism is all well and good, but when it comes to video games, it will only get you so far if a title lacks the ‘enjoyment factor’. Sure, in terms of playability, NBA Jam is far realer than any of its hoop-sinking predecessors, but the on-court action is purposely exaggerated, allowing players to soar to unrealistic heights and perform the kind of slam dunks that had long been restricted to a child’s imagination. Gravity boots would prove essential. The title’s gameplay exceeds all limits of enjoyability, and even now, a quarter of a century on, it is hard to stop once you begin playing, especially when taking on a friend. The game is fast and frenetic, capturing the essence of the sport with its relentless back-and-forth action, while most matches have the propensity to go down to the wire, forcing players into last ditch punts from their own area as the final seconds tick agonisingly away. The sound effects also add to the hustle and bustle, from the squeaking court to the agonising sound of the buzzer as you fight to stop the tie slipping through your grasp. The game also strips away traditional rules, making for ruthless dog-eat-dog battles as opponents shove you to the floor and slap you down mid-flight without repercussion, while free throws are nonexistent. The only rule in an otherwise lawless environment is that of goal tending, but this only adds to the agonising margins between winning and losing. Hey, I can see my momma! Another winning element is that NBA Jam sees fit to reward players in the most delightfully creative ways. Whether it’s hoops bursting into flames, backboards shattering or a limitless sprinting ability acquired from consecutive baskets, there is always a reason to push harder, sacrificing the temptation of a score enhancing three-pointer by turning up the style and pulling of the wildly impossible. Has NBA Jam been surpassed in the years since its release? Well, gaming has come a long way, but the exterior thrills which rear themselves with every generation often fade, and in the end only a few games remain standing when the technological dust clears. Those games are the ones which never become tiresome, whose capacity for enjoyment never fades, and NBA Jam: Tournament Edition is most definitely one of those. Gameplay. Whether it’s the frenetic scrummage of the hustle, rapid, freestyle dribbling or super-charged slam dunks, this is the real deal for basketball fans, a game that even casual fans will find impossible to resist. Hell, even if you’ve never held a basketball, you’ll be instantly hooked, guaranteed. Hearing the words ‘He’s on fire!’ as your opponent’s hoop goes up in flames takes some beating, but nothing trumps the sound of shattered glass as you turn the opposing team’s backboard into a glitter of dancing crystal. So this is what it feels like when white men jump! Well, almost. Time is ticking and your opponent scores. You trail by a single point, but with a second on the clock the game is over, right? Perhaps, but you can always punt it up there, making a quick pass and watching hopefully as your teammate takes a wild, swinging shot. It soars through the air, you and your opponent sit there staring. The two of you are breathless. The shot misses. But it’s the ‘just maybe’ that makes you feel alive. NBA Jam: Tournament Edition never fails to smash through the boundaries of the impossible, while adding just enough realism to wrap gamers in baller authenticity. It is basketball at its most exaggerated, at its most engrossing and addictive. Simply put, it is the crème de la crème of 16-bit sports titles, and one of the most rewarding video game experiences ever realised.